Early treatment for many medical conditions often occurs because the person believes that the treatment will resolve on its own. Hay fever is one of those conditions that falls prey to this mistaken belief and sadly it means that sufferers continue to experience the painful symptoms of hay fever. It also means that as the symptoms worsen, hay fever sufferers can become susceptible to secondary bacterial infections or run the risk of related complications. One of the problems that arise from delayed treatment is nasal sensitivity. 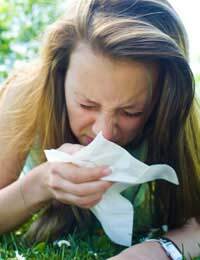 Sufferers find that the redness, irritation and sensitivity they experience in their nose makes the allergens strike even harder. This means that the same amount of pollen will have a stronger effect because your nose is already irritated from previous exposure. Unfortunately, this also means that each exposure sensitises your nose a bit more, resulting in a painful cyclical effect. In addition, the delivery methods include capsules, tablets, drops, sprays and injections. Your doctor and pharmacist will help you to choose the right medication and delivery method that is best for your hay fever symptoms. With so many options to choose from, there is no reason to delay your hay fever treatment. Although your doctor and pharmacist can help to determine which medication is most appropriate for your symptoms and lifestyle, it can sometimes be a case of trial and error. Side effects and efficacy vary from person to person and by embarking on early treatment for your symptoms, the need to find an effective treatment is less immediate than if your symptoms persist and worsen. It's always best to begin treatment early so that you can try different medications, if necessary, without suffering tremendously in the process. As much of a chore as it may seem, it's important that you take preventative steps early on to minimise your hay fever symptoms and also reduce the amount of medication that you need. If pollen is an allergen for you, as it is for most hay fever sufferers, monitor the pollen count and take medications in advance on days when you know the count will be high and you will be outdoors. If you have been putting off medical help for your hay fever in hopes that it will soon resolve on its own, you should now realise that it is only likely to worsen. It is hoped that you will see your doctor, who can help you find a treatment plan that is realistic and manageable. By obtaining treatment earlier, you can help to avoid complications associated with hay fever and you can get back to healthy, hay fever free living.